At age 98, Dr. Nelson Nix died peacefully at Kipnes Veteran’s Center. Born in Edmonton, Nelson is predeceased by his wife Amy (Nancy) Nix. Nelson is survived by six children: Nancy (Stan) Gooch, Richard (Melanie) Nix, Mary (Ralph) Gibson, Catherine (Larry) Duchesne, Lorraine (Gordon) Matties, and David (Natasha) Nix; 10 grandchildren; and 10 great-grandchildren. Following the tradition of his family (Edward and Edna Nix), Nelson attended Wesley United Church throughout his life. 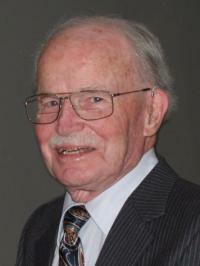 He attended Oliver School, Victoria High School and University of Alberta Medical School. He served his residency in Hamilton, Ontario where he met his future wife, Amy Beeching. Nelson Nix served in WWII as Major in the Medical Corps and earned his specialty in Anesthesiology shortly after. He played a major role in the battle against polio during its epidemic in 1952 and 1953. He was Chief of Anesthesiology at the Royal Alexandra Hospital where he practiced until age 72. Nelson was active in many sports, including curling, downhill skiing and sailing. He hiked with the Skyline Hikers for many years. He travelled to Europe, China, South America, Southeast Asia and India, and trekked to Everest base camp. He often drove his family across Canada to visit Amy’s family. A Celebration of Life will be held in the summer. In lieu of flowers, donations in Nelson Nix’s memory can be made to Medecins Sans Frontieres / Doctors without Borders, Faculty of Medicine of the University of Alberta, or to Royal Alexandra Hospital Foundation of Edmonton. The family thanks Amanda Barrios and Kipnes Veteran’s Center staff for their very good care and attention.